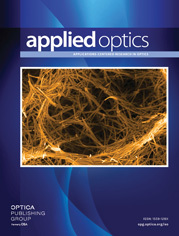 The authors are with Technische Hochschule, Ilmenau, Institut für Physik, Weimarer Strasse 32, Ilmenau 0-6300 Germany. We propose an improved method for attenuated-total-reflection experiments in the Otto configuration. This new technique overcomes the difficulties that arise from the nonuniformity of the air coupling gap. Thus attenuated-total-reflection measurements, under ideal adapted conditions, can be made for a wide range of wavelengths. The determination of optical constants by a three-parameter least-square fit of the experimental data to Fresnel’s theory always yields ambiguous results. We found that the ambiguity is caused by the loss of the phase angle in the reflectometry. Measurements for many air gap thicknesses in normal or extreme attenuated-total-reflection techniques, overcome this difficulty.